I've been gardening for a long time and I don't think there's been a year where a new disease or insect hasn't shown up in my lawn or garden. In this first of a series I'll give you my top 10 plant diseases that you're most likely to see. INumber 10. Fire Blight on Ornamentals. Blossoms and leaves will suddenly turn brown or black, but will usually stay attached to the plant. Cankers on branches are usually dark brown or purplish in color. 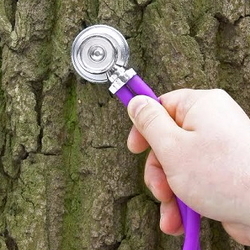 ( A canker is a dead or dying area usually found on branches.) The terminal branch will usually bend and look like a shepard’s crook. Prune and dispose of any infected branches as soon as you notice them. Pruning tools should be sterilized with alcohol or bleach during pruning to avoid spreading the disease to other parts of the plant. Remove water sprouts (water sprouts are fast growing branches that grow staight up from established branches) as soon as they appear, they are very susceptible to this disease. Chemical control is not recommended for homeowners. Crabapple and pears are prone to Fire Blight, when purchasing these choose a variety that is resistant to this disease. Number 9 Nuisance and Detrimental Molds. Organic mulches are a valuable asset to the gardener. They control weeds and retain moisture. They add valuable beneficial microorganisms to the soil. However every now and then undesirable microorganisms find their way into our soil. The result is molds and fungi. 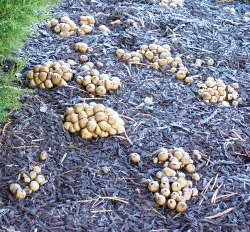 How many of us have discovered slime or mushrooms appearing overnight in our mulch? The fungal growth is caused by a lack of oxygen. If you have a reoccurring fungus problem, sprinkle and rake in a little high nitrogen lawn fertilizer, for example a 24-0-0 into the affected areas. This is a bacterial disease which attacks seedlings as they emerge. It thrives in wet, poorly drained and cool soils. To avoid this problem, when starting seeds follow sanitary practices. If reusing containers make sure they are clean. Sterilize in a 10% bleach solution. Allowing the soil surface to dry out will go a long way in preventing this problem. If, for some reason, your seed starting mix remains wet for an extended period of time, look to your kitchen cabinet to help prevent the disease. Cinnamon powder is a natural fungicide and has been shown to be particularly effective against damping-off. In addition, Weak chamomile tea ( 4 tea bags per quart of water) is another natural fungicide.Spray seedlings every week. 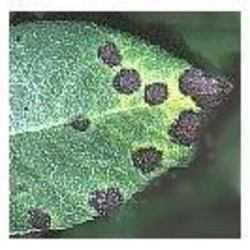 This is a fungal disease that usually attacks ornamentals and fruit trees. Dry, reddish orange, spores are usually found on the under side of leaves. 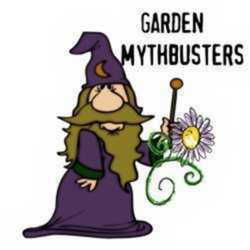 Moderate amounts will usually not harm plants. 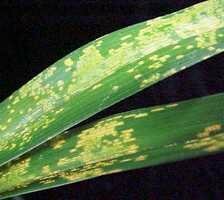 Severely infected plants can die from rust. Rust is extremely difficult to control. The most effective means is to identify the fungus early and remove affected leaves, including fallen leaf debris. The leaves should be placed in a sealed bag for disposal or burnt. Never place infected debris in the compost bin. Rust can also be controlled with sulphur and homemade sprays made from Chamomile tea. 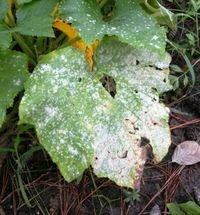 A fungal disease usually causing the most damage on cucurbits (curbits are plants in the cucumber, squash gouard and melon family) than any other crop. In 2006 in southern Michigan this disease destroyed 90% of the pickling cucumber crop and cost farmers millions of dollars. Yellowish in color it eventually turns the entire leaf yellow. Spots appear between veins on the leaves; the plant dies very quickly once attacked. Proper spacing of plants to allow adequate air circulation is important. Yellowish in color it eventually turn the entire leaf yellow . Avoid overhead watering to keep the leaves as dry as possible.Foliar fungicides such as Daconil or Maneb can be used as a preventive. They must be applied every 7 days.This disease also attacks watermelons and cantaloupes. 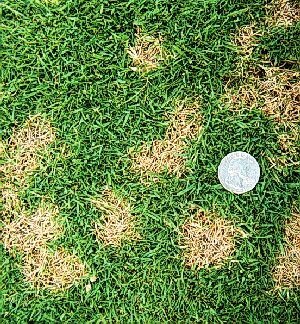 Dollar Spot is a fungal disease that is present worldwide. It is usually found on bluegrass and fescues. It usually appears during cooler weather throughout the year. It first appears as tiny yellow spots on the grass blades. As the blades begin to die the area enlarges until you have dead circles 2-3 inches in diameter. A healthy lawn is the beat way to resist fungal diseases. Fertilize on a regular basis. Do not water late in the day to avoid the turf being wet for long periods. Select resistant varieties. 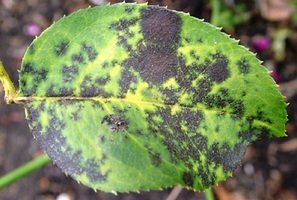 This is a fungal disease that appears in all gardens at one time or another. It appears as a whitish or gray powder on the leaves. Severe cases will turn the leaves yellow. Buy only top quality healthy plants; provide adequate spacing to allow for air circulation. Do not water late in the day. Several fungicides are available for chemical control. 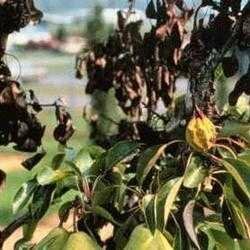 The most devastating disease to attack clematis. It is a fungal disease. The disease appears as a sudden stem collapse just as the flowers begin to open. One or several stems on the plant may discolor and collapse. Remove affected stems below the discolored areas. Safer Garden Fungicide or Thiolux are recommended chemical controls. Fungal disease appearing on rose leaves as small dark circles 1/16 -1/2 inch in diameter. Entire leaves that are affected turn yellow and fall from the plant. 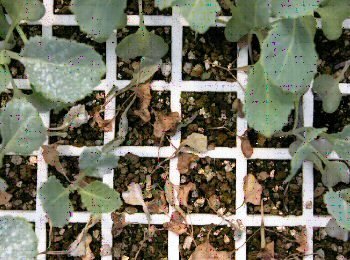 If left untreated, the plant will weaken and die. Follow good sanitary practices. Clean up beds, remove diseased leaves and place in trash, do not add to compost. A regular spray program of fungicides is critical to prevent this disease. Switch between several brands to avoid the plant building up an immunity to a specific brand. I spray my roses every 4-6 weeks during the growing season. A physiological disease most usually seen on tomatoes but can also attack peppers and egg plant. Usually seen on plants grown under favorable conditions early in the season then subjected to a long period of drought. Calcium deficiency can also contribute to this disease. 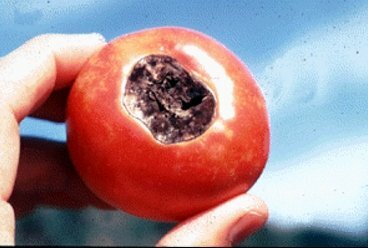 Appears as a dark spot at the blossom end of the fruit (opposite the stem end). The skin of the affected area becomes black and leathery. Maintain an even supply of moisture. There you have it. There are other diseases that will attack your plants but I feel these are the ones that you are most likely to see. 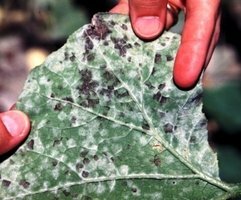 Check your plants often and take action as soon at you see a disease.